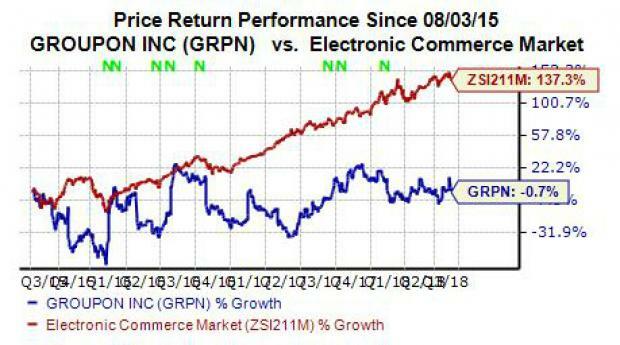 Should You Buy Groupon (GRPN) Stock Ahead of Q2 Earnings? Shares of Groupon GRPN slipped 1.5% during regular trading hours Wednesday in a small pullback that might signal investors are hesitant about the firm ahead of its second-quarter earnings release Friday. But the stock is cheap on its face, resting under $5 per share and also boasts some solid bottom-line growth projections. Groupon is currently in the middle of a transition to a marketplace-first firm away from its original dependence on coupon-style deals on goods, meals, and services. The company has also grown through collaborations with Expedia EXPE, FanXchange, Live Nation, and more. Meanwhile, Groupon’s May purchase of Cloud Savings, which is the parent company of online discount code platform Vouchercloud and brand loyalty provider Giftcloud, is set to expand its international reach in the UK and beyond. The company’s shift toward the local services market is aimed to help Groupon achieve higher margins. However, this means the company is set to sacrifice higher revenues in the near-term. Investors should also note that a U.S. jury just recently awarded IBM IBM $83 million in its patent dispute against Groupon. Moving on, shares of Groupon have plummeted nearly 47% over the last five years. Over the last three years, GRPN stock has moved nearly completely sideways. This falls far behind its e-commerce industry’s average, which of course features giants Amazon AMZN and Alibaba BABA, as well as the newest Chinese digital shopping player, Pinduoduo PDD (also read: What’s So Special About the Latest Chinese IPO Pinduoduo?). Our current Zacks Consensus Estimate is calling for Groupon’s Q2 revenues to sink by 4.8% to hit $630.77 million. For the current year, GRPN’s top-line is expected to slip by nearly 7% to $2.65 billion. Groupon’s second-quarter looks much better at the bottom end of the income statement, with its adjusted Q2 earnings projected to surge 50%. Looking a bit further ahead, the firm’s full-year EPS figure is expected to soar by nearly 120% to $0.24 per share. Groupon has received one upward earnings estimate revisions within the last 30 days for both the following quarter, fiscal 2018, and the following fiscal year, against zero downward changes. The company has also topped our earnings estimates in 10 out of the last 11 periods. We judge the price effect of these earnings beats by comparing the closing price of the stock two days before the report and two days after the report, and GRPN stock has surged in four out of these previous six windows. Groupon is currently a Zacks Rank #1 (Strong Buy) that rests under $5 per share, which also trades pretty heavily around earnings. Therefore, GRPN stock might be worth considering ahead of the release of its Q2 financial results due out before the market opens Friday.